SETI Cascade Starmap from Firespiral Slings is a blend of 57% cotton, 27% linen & 16% viscose. It's about 305 GSM making it a thick wrap. It's woven using Firespiral's Alchemy Weave which is slightly looser and makes for lovely soft & mouldable wraps. Firespiral wraps come with an attractive cotton bag and pin badge as well as a guide for safe use. SETI, is named for the Search for Extraterrestrial Intelligence, "an exploratory science that seeks evidence of life in the universe by looking for some signature of its technology". I can see how the variegated deep turquoise and smokey grey (with a hint of purple) Cascade warp would have inspired such a name, especially on the Starmap design. The effect is a mottled pinstripe that conjures up thoughts of radio pulses, TV signal interference and the rings of Jupiter. The Starmap design is a Firespiral classic. A universe of blinking stars, comets and galaxies on a star chart, complete with astronomers tools along the rail, it looks beautiful wrapped. Starmap is a delicate, detailed design that gives two distinctly different sides in mirrored colours. SETI has an ecru weft. The difference in the thickness of the linen and chunky viscose threads creates a textured striated effect which looks lovely as well as adding a bit of grip to the Starmap design. Compared to many Starmaps, the SETI Cascade colourway is fairly low contrast. In hand SETI has a reassuringly heavy weight and beautiful floppy drape. The Cascade side is kitten belly soft while the paler weft side has a striated ribbed texture. I recently learned that the cotton used for Firespiral's Burnish & Cascade warps is slightly thicker than that used for their previous warps, and it shows. Let's face it, they've always been lovely and soft, but Burnish and Cascade are like Twilight after a few extra doughnuts. When wrapping, the passes glide into place. The Starmap design itself doesn't create much grip, but SETI's striated textured weft is grippy enough to ensure that everything stays where you put it. SETI is surprisingly mouldable for a thick wrap with the viscose providing a nice little bit of stretch. I'm not sure how much use the tester had had, but experience tells me that even thick Firespiral Alchemy linen needs little breaking in. Suffice to say that this 'beast' was tamed to the point of purring and sitting at the dinner table. Despite the weight of SETI, it still ties a neat knot and doesn't feel bulky or wrap short. I absolutely love Firespiral's thicker linen blends and the SETI tri-blend is no exception. SETI is lovely and strong and has uber amounts of blankety cush. It got a serious test of comfort when my poor toddler got his thumb squashed in a door while already suffering from a nasty bug, and needed up. His brother (also poorly) was already asleep on my front so I added my toddler in a basic ruck and stood gently swaying throughout the whole of Frozen and most of Toy Story 3... it was pretty much the end of the world as we know it but miraculously, my shoulders felt fine! SETI was pretty much as comfortable as it's possible to be when standing on the spot for several hours, needing a wee & carrying your two 'babies'. Despite extended expeditions searching for intelligent life (bees!) SETI didn't slip or sag and rendered both of my wrappees as weightless as if we were bouncing-in-zero-gravity... well as close as is possible here on planet Earth anyway. If you've been tempted by the soft, floppy, mouldable nature of viscose, but were concerned that it may be a little too stretchy for a heavier wrappee, SETI is the wrap to try. 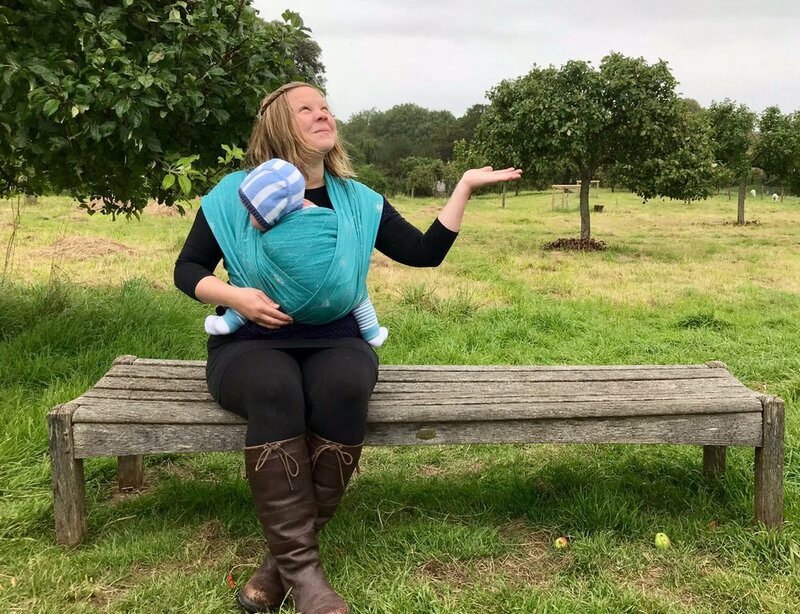 The substantial linen content and heavier weight make for a very strong and supportive wrap, while the viscose qualities make it soft and mouldable. Suffice to say, SETI would make an amazing shorty or ring sling for a heavy toddler or preschooler but is still sufficiently soft, breathable and mouldable to work for a small baby and in multi-layer carries. Being a cotton / linen / viscose blend it's super easy care and can be machine washed and tumble dried. Its weight and the floppiness of the viscose also mean that it's not as prone to creasing as linen blends often are. SETI Cascade may well be evidence of alien technology! It's extremely cushy, supportive and strong, while still being beautifully soft, floppy and mouldable. 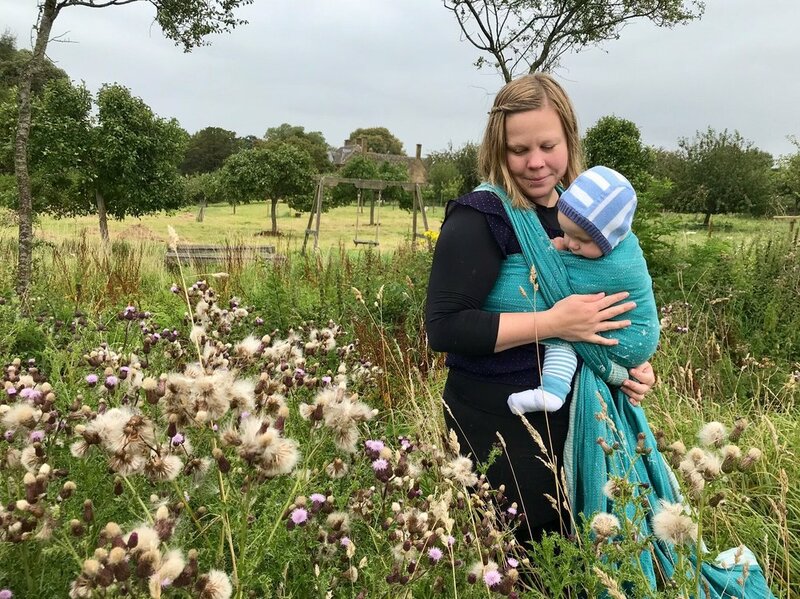 Perfect for heavier wrappees, but also lovely for smaller babies, it excels in single layer carries and is as protective as a force field in base size. If extra terrestrials turn out to be more 'Alien' than 'E.T,' SETI is the wrap you want on your side! SETI Cascade Starmap will be released on 30th September and available to buy from the Firespiral Slings website. I recommend following them on Facebook for all their news and details of upcoming releases.